The love of the circus and the Big Top has been a North American institution for over 200 years. From the large circus with its many rings to the small traveling ones that can be usually seen in the summer time in not only a farmer's field, but on the black top of a local mall. The circus has been reinvented many times in those two hundred years. The circus arrived in North America in 1793. It was a small affair with only one ring. The famous elephant that one associates with the circus it actually did not become apart of the Big Top until sometime in the 1800's. Cat acts which included: lions, tigers, leopards, and panthers appeared in the 1830's. As the circus became more of an organized business - agents would be sent ahead to put up posters, talk it up among the local towns folk. It was the start of what is known today as media advertising. In this way by the time the circus arrived in town the hype had been well established and the community was ready to pay to watch and enjoy the product. Of course the individual that one has come to associate with the circus was Phineas Taylor Barnum. He was born in Bethel, Connecticut on July 5th, 1805. He started out as the owner of a confectionary and fruit store. His original start was not in operating a circus, but in operating a Museum which exhibited over 500,000 natural and other curiosities of the world. At the age of 60, he formed and began to tour with the P. T. Barnum Grand Traveling Museum, Menagerie, Caravan and Circus. It covered all the bases. He brought to the public what today is politically incorrect - the Freak Show. He knew just like the public of today and its fascination of Reality Shows, the so-called freaks were unique. Some of the public wanted to see the deformity while others were interested in seeing a unique individual. It was a great marketing and selling item. The shows first year of operation grossed over $400,000. By the mid 1800's circuses had become a major gate attraction across North America. By the end of 1860 there were over 30 circuses traveling the United States. The circus brought entertainment to a continent where the population was expanding and it traveled into areas where it was the only entertainment available. Each circus owner attempted to outdo the other for the attention and business of the customers. There were showboats with whistles and chimes on the top of the ship to let the public know that the circus was just around the next river bend. The wagons had open sides so that the lions and other "wild animals" could be observed. There were the calliope wagons and their rich sound that became the advance for the circus show. By the time the show appeared the community was in a fever pitch and ready to spend their money at the show. Souvenirs began to be sold, in addition to admission to the show. In 1857 the famous pink "Cotton Candy" was invented by Thomas Patent. In 1871 the first circus train appeared. The circus train cars were the fore runner to the modern day piggy back rail cars. Circus trains would continue to grow and eventually reached 85 full railway cars in the 1890's. Into the 20th Century the circus had the public much to its own. There were few cars, no radios and movie theaters to compete with. In 1872 Barnum ever the showman and businessman hit upon the idea to add a second ring to the circus. Two rings, larger tent, twice as many customers for one show. Through the years the key ring became the centre ring. Every circus act worked to end up performing in the centre ring - it meant that the entire audience was focused on your act. It was the high point of a performers career. Into the 20th Century a new family emerged as the Circus Family. The five Ringling Brothers from Baraboo, Wisconsin. Al, Slf, Charles, John and Otto would become the Circus Kings of the 20th Century - the "Kings of the Circus World." In the proud tradition of overstatement in the world of circus - the official name of the Ringling Brothers Circus was; "Ringling Brothers United Monster Shows, Great Double Circus, Royal European Menagerie, Museum, Caravan and the Congress of Trained Animals". Not only was the circus big in the 1800's, but the Wild West Show, which was a variation of the circus, just now under a Big Top. The most famous Wild West Show of the day was Buffalo Bill's Wild West Show. Wild Bill was to say the least a colorful character of the day. He wired New York newspapers of each of his adventures. His life in show business began with a five act melodrama play entitled: "Buffalo Bill's First Scalp for Custer". America wanted to see and watch more of the exploits of the cowboys and eventually the European countries called for a visit by the famous cowboys and Indians of the American West. The show became known as the Buffalo Bill's Wild West and Congress of Rough Riders of the World Show. Show programs have become not only very collectible, but rare objects to search for. The show went out for about three hours and included wild west riding, demonstrations of marksmenship and the high point some sort of a battle against plains Indians. For collectors it should be noted that the term in the show Rough Riders predated Teddy Roosevelt's use of the word in the War of 1898. In fact, President Roosevelt borrowed the term from Wild Bill. Even Annie Oakley the famous female sharpshooter toured with her own show the world and became as popular if not more than Wild Bill. In the world of circus there were two other main players that the collector seeks out their material. Clyde Beatty the famous animal trainer had his own circus in the 1930's - 50's. He was famous for the focus on the wild animal acts as that was his speciality. Tom Mix the famous silent and talking cowboy star had his own circus. He traveled across the United States with Tony - His Wonder Horse. Admission to the Tom Mix circus in 1935 was 60 cents for adults and 25 cents for children. The material from the Tom Mix circus is sought by crossover collectors - circus, wild west and of course movie collectors. Tom Mix billed his show as the "Most Entertaining Show on Earth". Included on the program were such talents as: The Aerial Arleys, the Ray Goody Trio, "High Wire Dancers", Irma Ward - "Queen of the Air", and "The Tom Mix Liberty Horses and Elephants". Tom Mix was killed in his famous convertible Cord auto in 1940. Of course the material to collect is unlimited. Circus posters, ads, flyers, material nailed to telephone polls, costumes, books of all types, toys, programs, circus flashlights, even train sets, comic books. One of the more famous was the Lionel Disney Circus Train Set. Marx manufactured a large circus playset in the 1950's. There have been picture card sets - some in 3D that were enclosed or mail away to the cereal companies. Small plastic circus figures were placed in cereal in the 1950's along with clown masks. Collectors can limit themselves to one area - as material connected to circus clowns is very diverse. 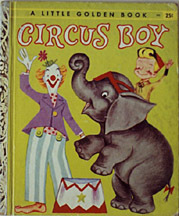 Even early television was fascinated of the theme of the Big Top. Super Circus aired on Saturdays at noon. Super Circus featured the train pulling into town at the start of every show. It featured acts introduced by Claude Kirchner the ringmaster blasting his whistle announcing in the center ring. The show ran ftom 1949 - 1956. Some of the sponsoring companies were Kellogg's, Quaker Oats, Mars candy. The other collecting area is to search for material from the smaller traveling circuses. One such circus was connected to the Gilmore Oil Company of California. In the 1930's and early 40's Earl Gilmore promoted his gas station products through a circus tour . Each season the tour started in California and visited all the Gilmore gas stations in that state and Washington and Oregon. A custom built speedster auto toured with the circus. The lion cubs rode inside one of the cars and the upholstery had to be replaced on a regular basis due to the sharp nails of the cubs. 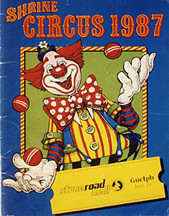 Since the Gilmore gas stations were regional in nature any material connected to the short life of the circus is very valuable. Comic books were issued and candy suckers in the shape of a lion given out at the performances..